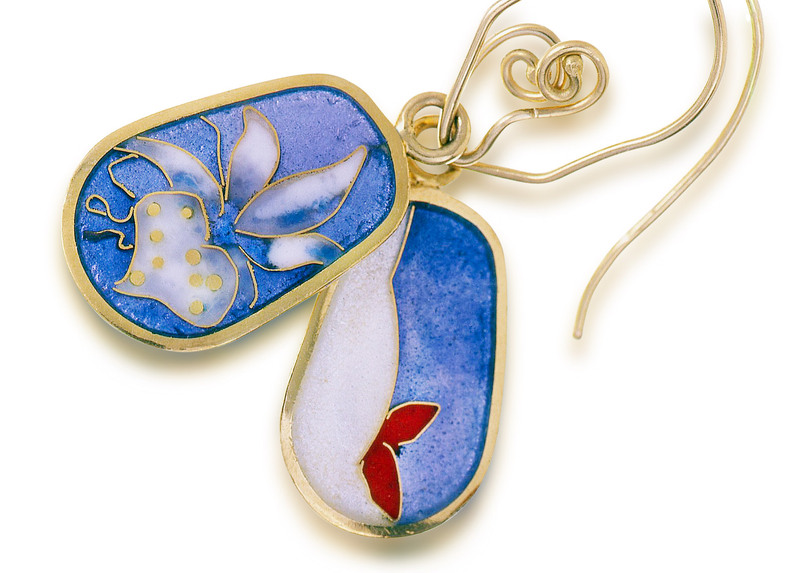 Orchid is a cloisonne jewelry piece of enamel earrings created by Patsy Croft. It belongs to Spring collections of amazing enamel jewelry with unique jewelry designs. These enamel earrings are part of my one of a kind jewel that you will not find anywhere else. How wonderful to own a true one of a kind! I developed this unique jewelry design of the double sided cloisonne earrings through years of experimentation. With a desire to create cloisonne jewels that can stand alone with no solder and with no need for a setting is exceptional. I am very proud of this accomplishment. You can see here you have two designs. This unique jewelry design allows the owner to have two pair of earrings as they can be worn either way!